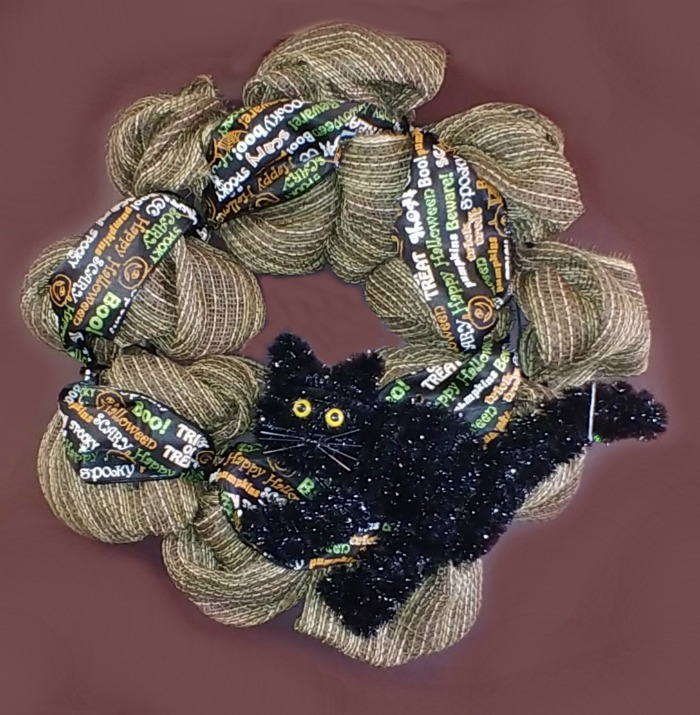 From burlap wreaths covered with bats to a colorful Halloween mesh wreath made with a black kitty cat center, these fall and Halloween wreath ideas will capture the spirit of the season in a spooky and fun way. The days are getting cooler and the leaves are falling. I love this time of the year, since I know that I have a good four months of decorating my home ahead of me. The front door is a great place to start. Fall is such a fun time of the year. Two holidays are featured in the seasons – Halloween and Thanksgiving and both give many opportunities to entertain and decorate. Why not host a Halloween cookie exchange this year? And what is a better way to greet holiday guests that a fun fall or Halloween wreath that showcases the season in a colorful and eerie way? How can I make some good Halloween decorations? The colors and textures of fall really lend themselves to decorating ideas for your front door. Natural fall greenery can be found in nature just by going outside on a scavenger hunt. And most craft stores are stocked to the ceiling with supplies to help you create your crafts easily. The Dollar store is a great place to shop for inexpensive supplies, especially for Halloween crafts, since this day is only one day long. 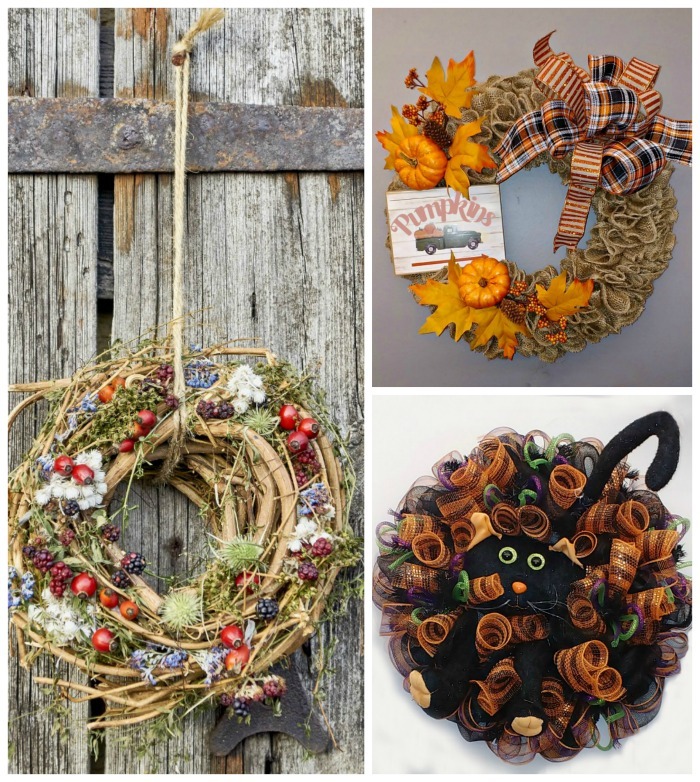 Gather some of these supplies together and use the pictures below to help you create a DIY Halloween wreath or a fall door swag that will wow your visitors. All of these supplies are readily available and can be made into a variety of wreaths. I love that most of the supplies can be reused from one season to the next. Keep your craft closet full of these supplies to make wreath making easy. Need some inspiration for your holiday decorating? Check out these hauntingly decorative wreaths for Halloween and beyond. Perhaps one of them will end up on your front door this year! These seasonal wreaths are all perfect for Halloween. They feature vibrant colors of purple and orange with Halloween motifs that will delight and scare. 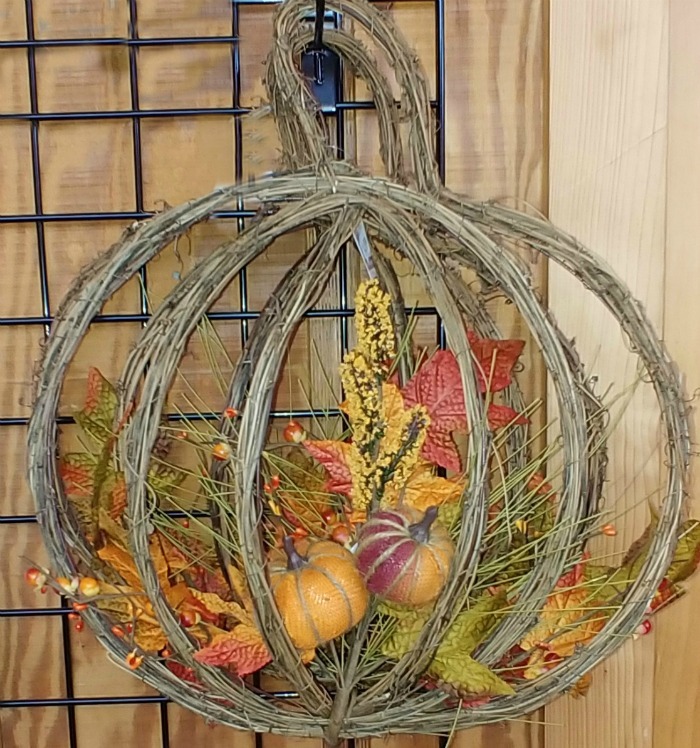 A fabric wreath has softness to it and burlap is a great material to use in fall because of the muted color. For this easy and fun wreath, pieces of burlap ribbon are tied to a wreath form. 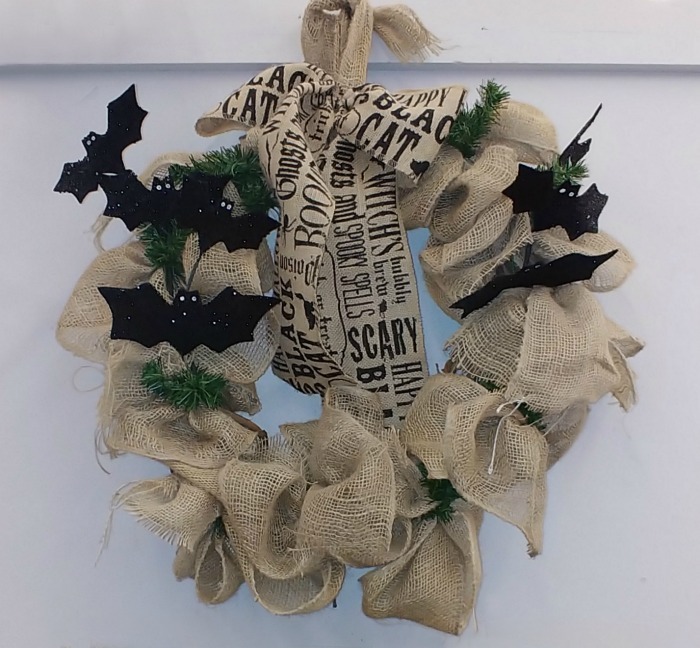 Bits of green pine boughs add a colorful touch and black bats give the wreath an eerie feel. Finish the look with a printed burlap Halloween ribbon and tie it to the front door to give your guest a spooky greeting. 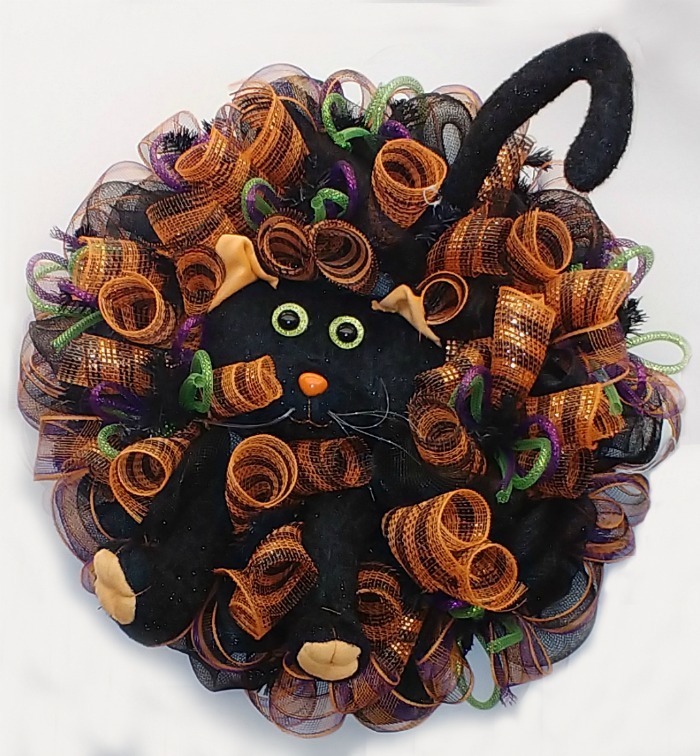 This Halloween decor mesh wreath uses vibrantly colored orange and black deco mesh ribbon that is is curled and attached to a wreath form. Add some thick stiff green piping and a stuffed black cat to the center opening for a fun look that the neighborhood kids will love. To make this fun witch hat swag, use a coat hanger to form a large triangular shape, making sure to bend the form over at the top. Wrap wide burlap ribbon around the entire wire frame. To make the brim of the hat, cover the base of the form with orange and beige burlap ribbon with a mesh center and fill in with some plain colored jute straw. 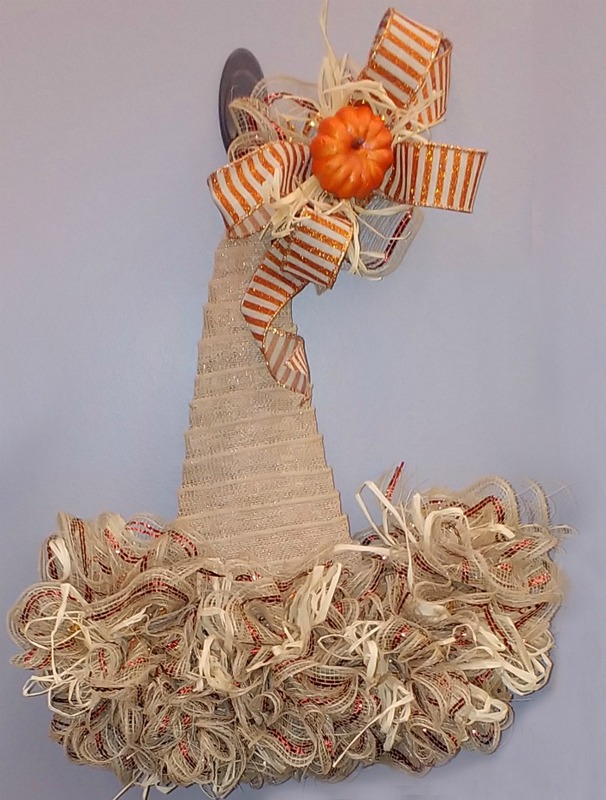 Finish the hat shape by adding a striped wire edged ribbon bow, backed with more of the deco burlap ribbon and a bright orange pumpkin on the bend of the frame. What fun! 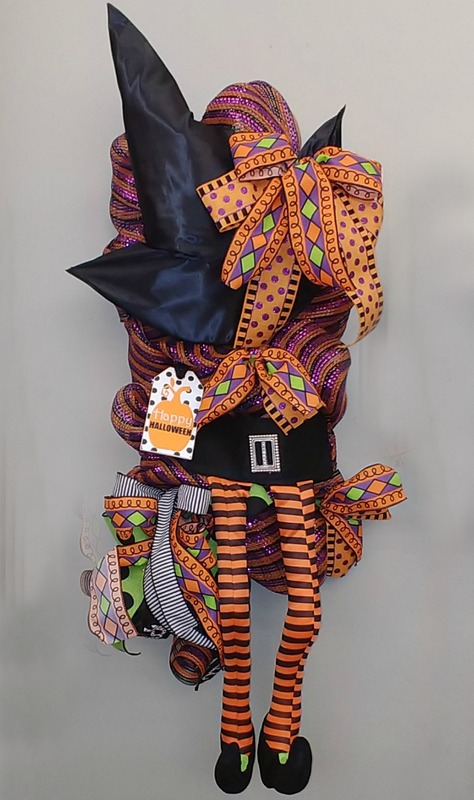 This brightly colored Halloween witch wreath uses several types of orange, green and black Halloween ribbon bows, a large witches hat, belt, and formed legs and feet to give the impression of a whole witch body. So spooky! Love this look? See more witch legs crafts here. Simplicity at its best! 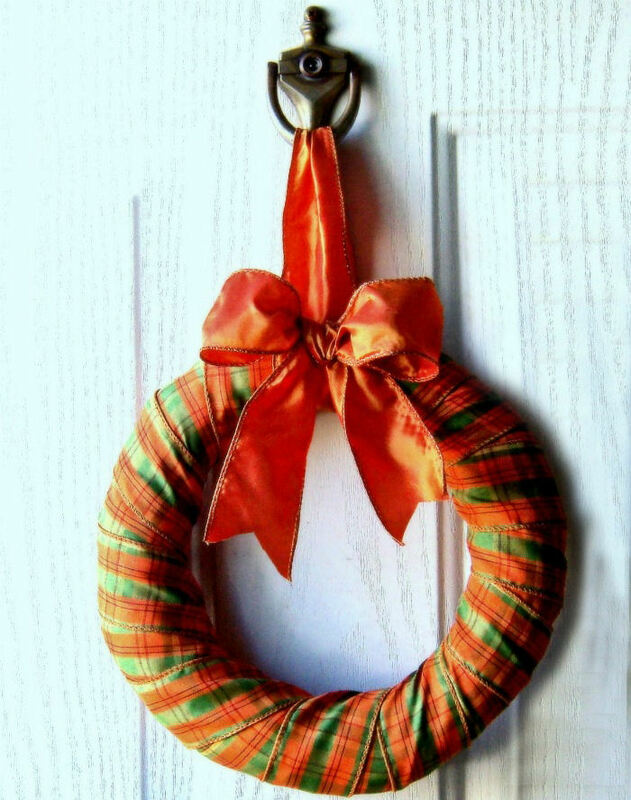 To make this outdoor wreath, simply wrap a foam wreath form with orange and green plaid wire edged ribbon until it is completely covered. Make a simple orange bow and hang. This project will be done in just minutes and will add a pop of color to your front door. This rustic looking Halloween fabric wreath starts with a simple round wire wreath form. Cover the whole form with pieces of wide burlap ribbon so that it forms a ruffled edge. Finish the look with a printed Halloween sign in the center and a large double formed bow. To use it for Thanksgiving, just swap out the sign for a harvest version and you are good to go. Even though this wreath appears to have the whole body of a witch, the effect is done by using clusters of big wire edged ribbons, with a black hat at the top and witch legs dangling from the bottom of them. A black sign with the words “welcome my pretties” issues a spooky invitation to all who dare to enter. 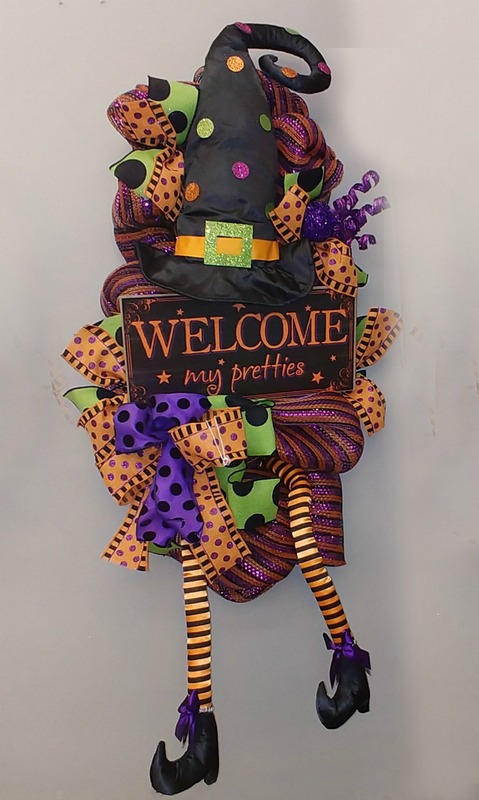 This wreath uses colored ribbon for a great Halloween effect. Big loops of wide burlap ribbon cover get loosely wrapped around a wreath form. Top this with a wide Halloween printed ribbon and a mesh black cat for a fun look that the kids will love. 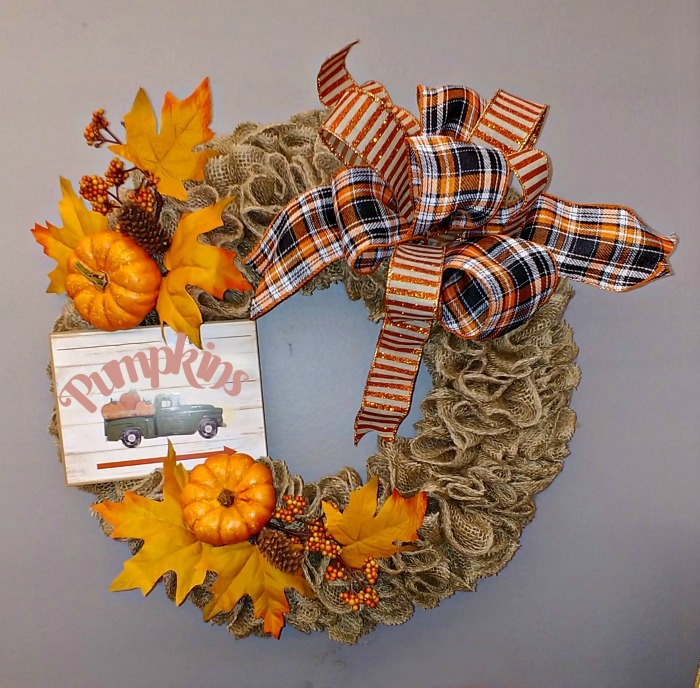 In contrast to the bright colors that most Halloween wreaths have as a part of their design, most fall door wreaths use the colors that appear in nature each autumn as the temperatures get cooler. Look for lots of orange, yellow and beige colors, along with pine cones, acorns, gourds, and dried flowers. This front door wreath will transition from Halloween to fall easily. To make it start with a grapevine wreath form. 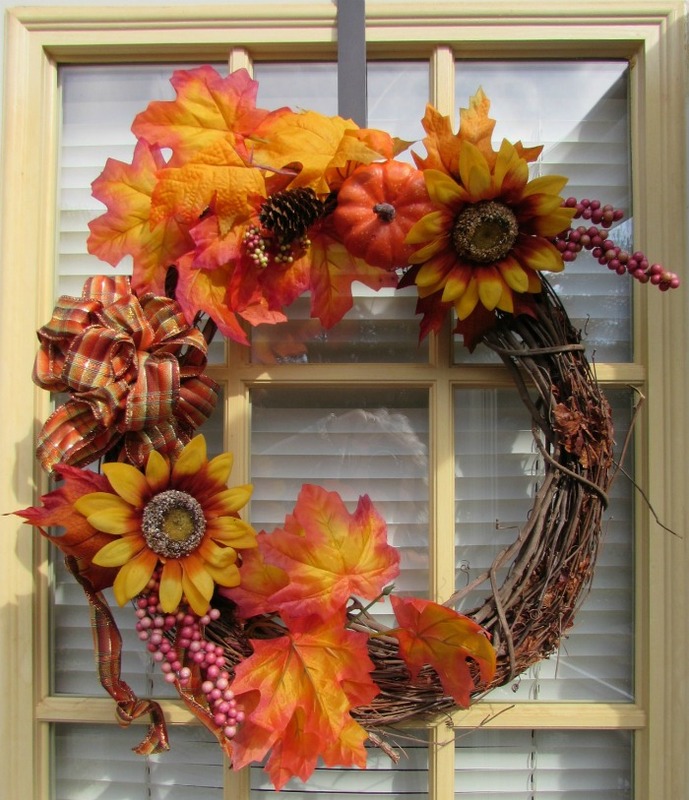 Attach faux sunflowers, orange and yellow autumn leaves and pine cones to one side of the wreath. A small orange pumpkin does double duty for both Halloween and Thanksgiving and a pretty striped wire edged bow completes the look. This pretty fall front door wreath has a wire wreath shape that is threaded with wide burlap ribbon so that it forms a ruffled wide circle. Yellow and orange maple leaves and berries as well as fall pumpkins are added to the left side of the wreath form. 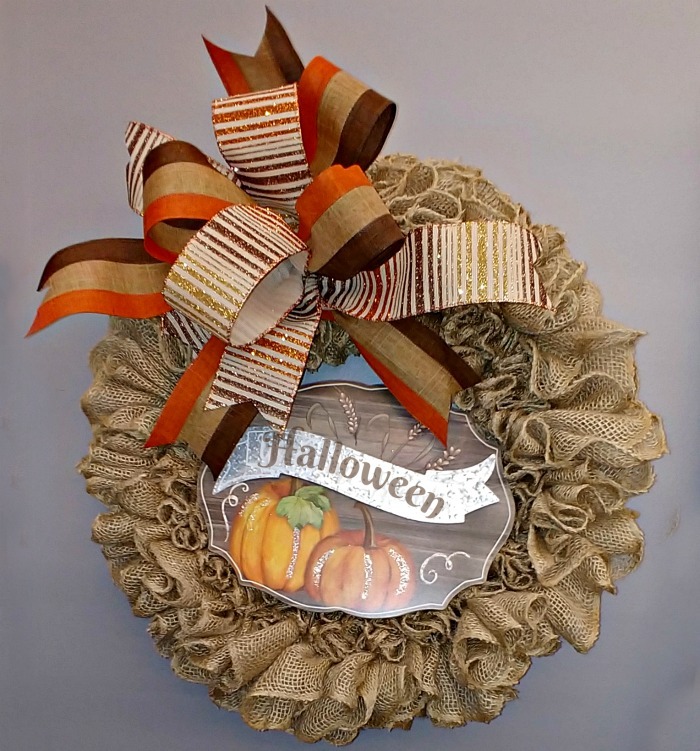 A striped brown and orange mesh ribbon bow and cute pumpkin sign complete the look for this pretty fall design. Front door wreath designs take all shapes and forms. In this unusual idea, wire and grape vines are used to form a cage that has a rounded front and flat back. Once formed, the cage is filled with fall pumpkins, leaves and grasses for a very unusual and rustic look. 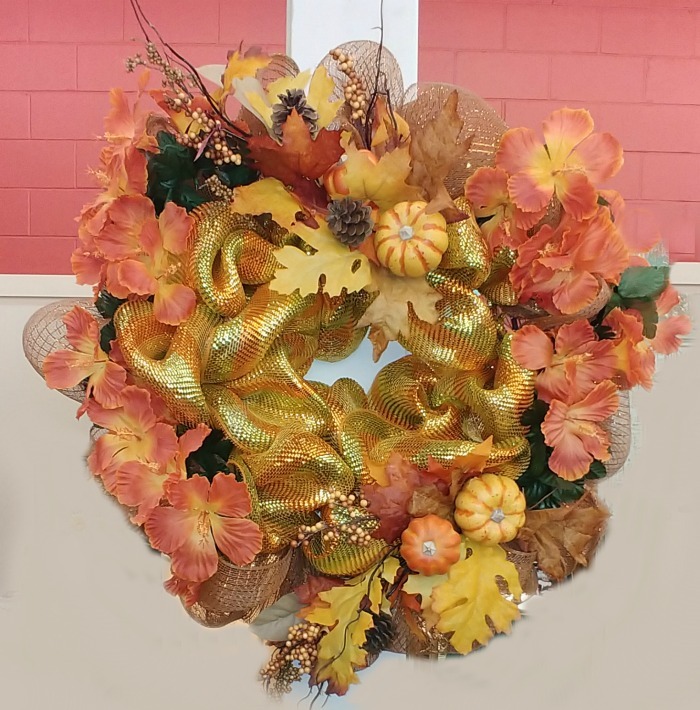 This gorgeous fabric wreath uses a shiny yellow and orange mesh ribbon along with orange hibiscus flowers, small pumpkins and fall leaves for a soft look that is just stunning. 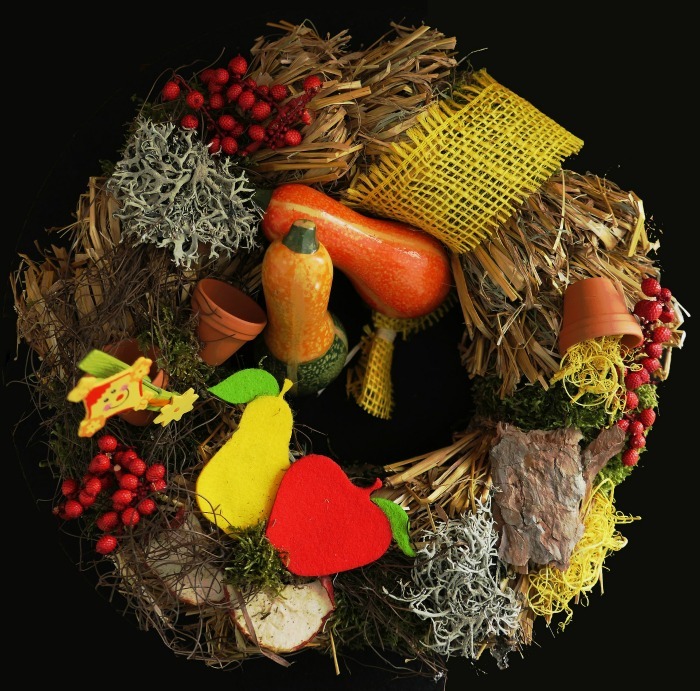 This colorful autumn wreath is made from a wreath form covered in corn straw and dusty miller dried flowers. Fringed burlap ribbon, berries and bits of dried vines complete the covering. Small terracotta pots, fall gourds and wooden cutouts in the shape of apples and pears add a big pop of color. What could be more perfect for fall than the look of falling leaves? 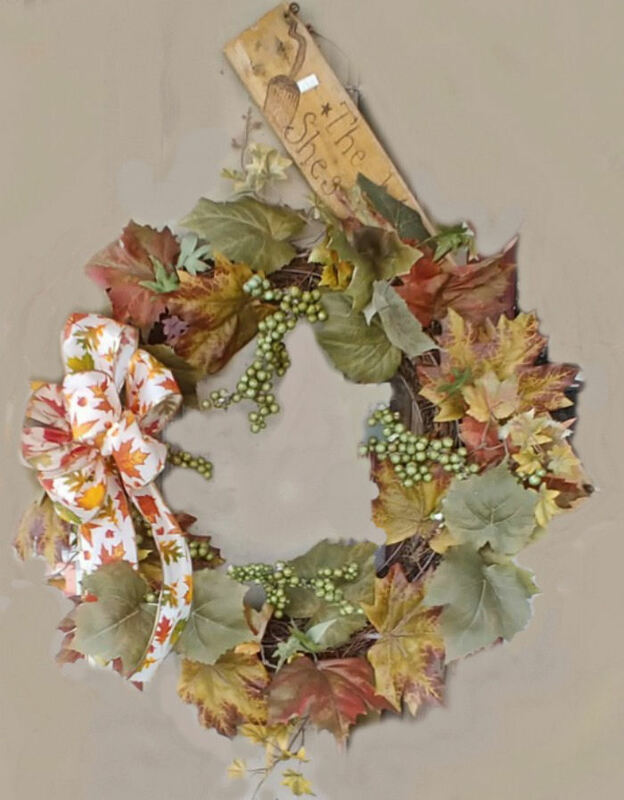 For this design, a grape vine wreath form is covered with softly colored leaves in shades of olive green, brown and orange. Small green berries, a thin wooden sign and a leaf motive floral bow complete the natural look. So pretty! Grab some light vines and wrap them in a circle. Add some berries, acorns and dried flowers and wrap with a piece of jute. 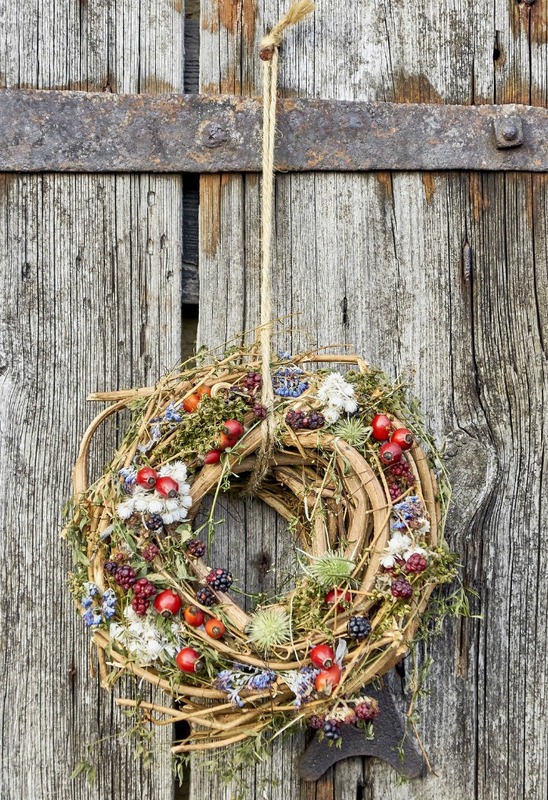 This rustic autumn wreath is perfect on the reclaimed wood door! 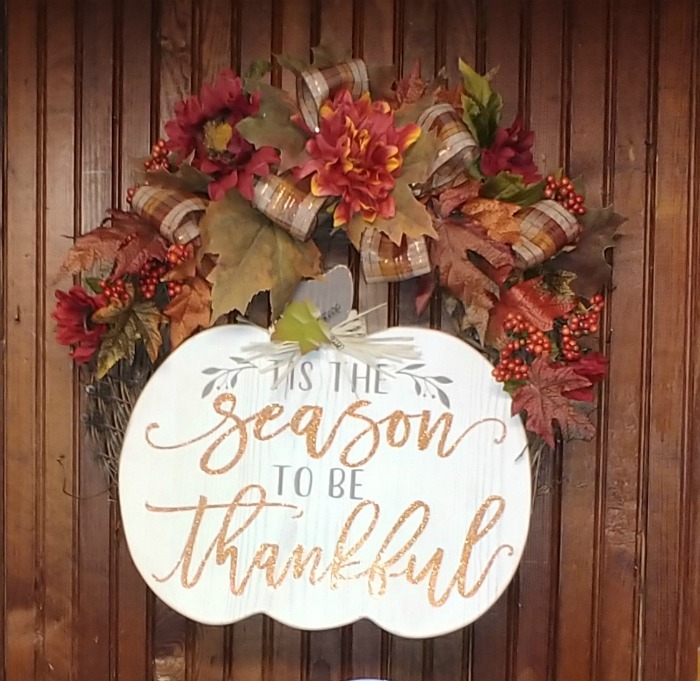 A large pumpkin shaped sign with Thankful wording takes up the bottom half of the covering of this grape vine wreath. The starkness of the sign is softened up nicely on the top with colorful autumn leaves, berries and flowers finished off with a big mesh ribbon bow. Wreaths and door swags are commonly used to decorate front doors but festive seasonal use of signs can also be another nice entry idea. 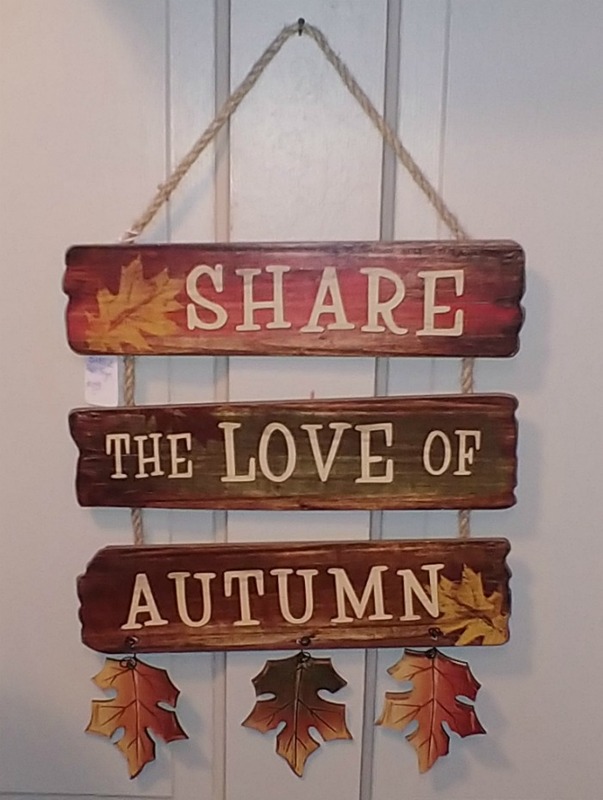 Three pieces of wood spell out the message “Share the love of Autumn” on this rustic door hanger. Wooden autumn leaves hang from the bottom piece of wood and two leaves finish the painting. Very rustic and natural looking! 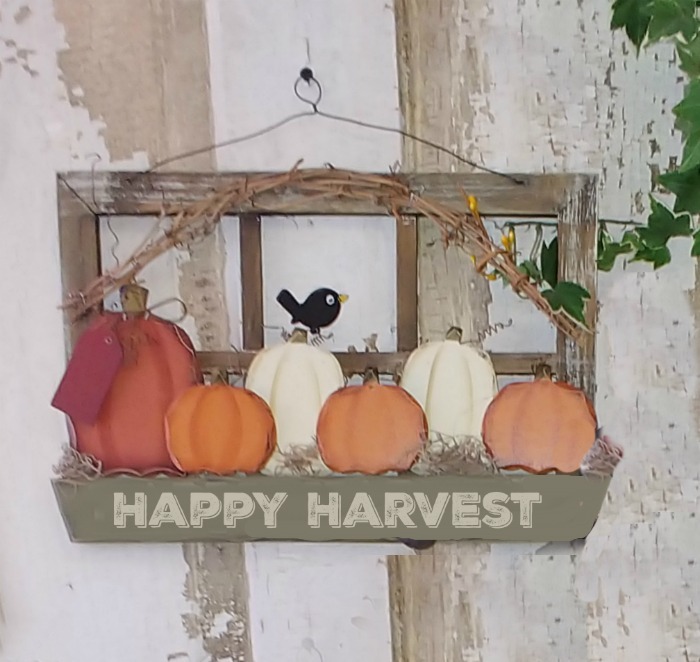 A simple wooden window shape is decorated with wood pumpkins, a black crow and bottom plaque that reads “happy harvest.” The design has the look of a rustic window box against the reclaimed wood door. I snapped a photo of this fall wooden door hanger on a trip to Kentucky recently. 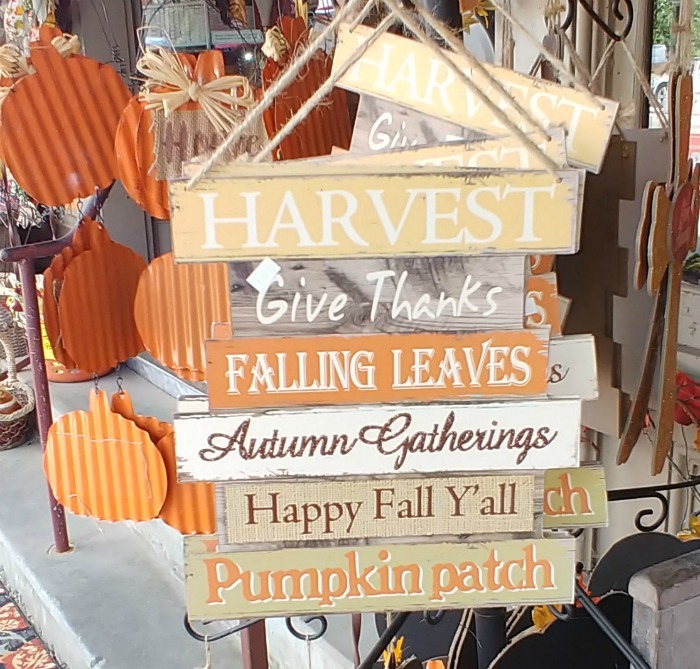 The colors of each piece of wood blend well and the fall sayings remind us to be thankful. 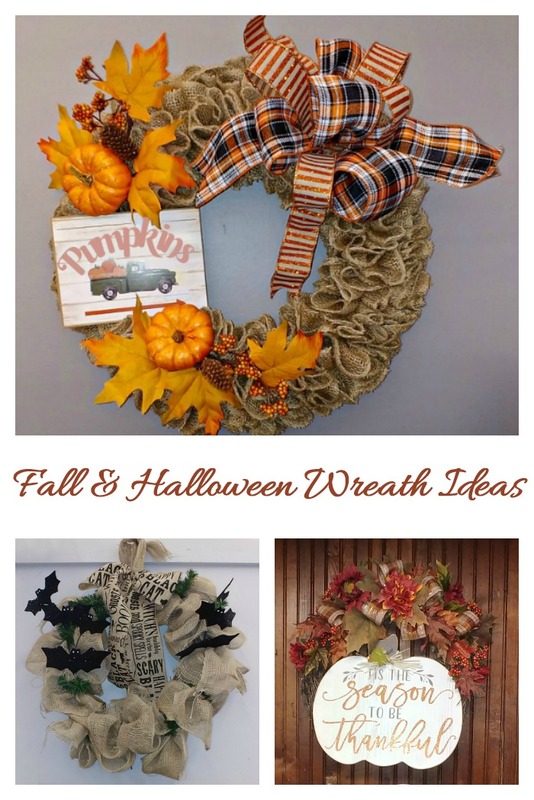 Would you like a reminder of these fall and Halloween wreath ideas? Just pin this image to one of your fall decor boards on Pinterest so that you can easily find it later. Now it’s your turn. What type of door decoration do you like to use for fall and Halloween? Let us know in the comments below.